Package Deals Can Be Messy! Worksite Wellness, Wellness Programs - Packaged Deals Can Be Messy! Abbott Solutions, Inc., recognizes that "turn-key" or one-size fits all solutions do not always provide business with the best options. Hiring the wrong insurance provider, vendor(s), or personnel on a piece-meal basis can create obsolete solutions or costly mistakes. and engage employees in managing their own health. An organized employer-sponsored program that is designed to support employees (and sometime, their families) as they adopt and sustain behaviors that reduce health risks, improve quality of life, enhance personal effectiveness, and benefit the organization's bottom line. as defined by Leonard L. Berry, Ann M. Mirabito, and William B. Baum in What's the Hard Return on Employee Wellness Programs? Harvard Business Review. Dec. 2010 pp 1-9. When providing wellness programming, health promotion defines the basic marketing and promotion of risk reduction health programs. These health programs are grounded in the disciplines of social marketing, health communication, business marketing and use of incentives that address consumer health "needs" and customer "wants". Improving social and economic conditions. Wellness however is based upon a holistic approach that requires individual transformation delivered through focusing on the 7 dimensions of wellness: Spiritual, Physical, Intellectual, Emotional, Career, Environmental and Social. Introduction to the Health Care Continuum Concept was started In 1970,.by John W. Travis, M.D., MPH. 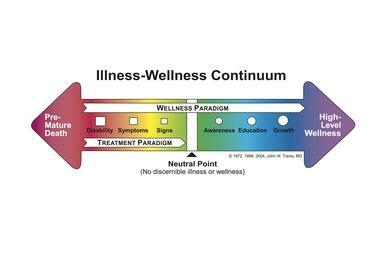 He envisioned the idea for the Illness-Wellness Continuum that placed "wellness" in a revolutionary new context and bridged health and human potential. This early health continuum model bridged the relationship between wellness, medically driven treatment models and high-level wellness. 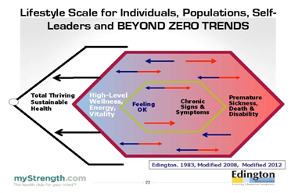 In 2012, Eddington introduced a new Health Care Continuum Concept about which he stated: "Instead of aiming for a return to the status quo, a focus on positive health would move us beyond the status quo toward outcomes that exceed expectations. While risk reduction and health maintenance are noble, it is time to move the focus and efforts toward positive health potential through improved physical, mental and social capabilities.". VBHC strives to remove barriers and align both financial and non-financial incentives and rewards for living healthy and productive lives by using prevention (population health), health enhancement strategies (internal policy, rewards and management support) and health care services (prevention and managed care). Medical services differ in the benefits provided. Abbott Solutions provides health management training, wellness program design and wellness planning for your corporate and employee wellness and health benefit plans. Abbott Solutions provides employers objective, customized and cost effective solutions to reduce health care cost and improve productivity through partnering effective wellness programs with creative customized return on investment (ROI) strategies reflecting individual corporate needs and cultures. We have one clear objective: To help you save time, resources and money by helping you pick the right health care benefits plan. We provide impartial guidance and counseling on selecting value based health care and provide post enrollment assistance in understanding and using health coverage once purchased. We help you find the best fit of insurance provider(s), vendor(s), and/or personnel for your organization's comprehensive wellness plan. Abbott Solutions, Inc., will assist in identifying client needs, and provides research to determine the best evidence-based practices that align with your employee base and budget. We provide impartial recommendations with practical solutions. We help you find answers to your company's questions about decreasing health care costs through instituting a comprehensive wellness plan prior to vendor solicitation. We put an expert on your wellness management team! We place an objective, impartial, seasoned professional on your management and wellness team. We provide subject matter and professional resource information to help individual companies determine their needs, eliminate duplication of resources and clarify resistance to change prior to purchasing a vendor's packaged "fix". We provide strategic wellness management systems to integrate wellness into corporate or organizational culture and increase ROI. We help you create a comprehensive wellness program at the least cost. Abbott Solutions, Inc., is a health care management consultant group that supplies strategic planning, operational management expertise, preparing research and responses to complex questions to help your management team understand how managing the costs of health care is the largest part of managing the cost of your business. Engaging management and employees in initial planning is best practice and essential in long term success. Abbott Solutions, Inc., works as an outsource contractor to provide customized research and on-site consultation, evaluation, training and coaching as needed. Who Do We Work With on Your Team? C-suite executives and managers interested in reducing health care cost and Value Based Health Care Management. Benefit decision makers, e.g., Health Benefit Analysts, Benefit Managers. Human Resource and Training and Development. Your internal communications and marketing department. Your wellness team who designs the employee wellness program and delivers evidence - based programs. Your health insurance providers, health insurance brokers, vendors and/or service suppliers. Your data management system group and healthcare project management team. Abbott Solutions, Inc. works with small business, corporate, and/or multi-employers, and for profit and nonprofit organizations. We Build Bridges, We Share and Ask Critical Questions. We bring expertise, resources in analysis, critical questions and organizational processes. Sharing "free source" resources to identify alignment with best practice models, e.g. Value Based Health Care, WELCOA benchmarks, HERO Employee Health Management for corporate wellness programs. Sharing professional research that companies may not have access to when making decisions for designing company wellness programs. Conducting the Starter-Benefit/ Wellness Analysis (TM), e.g., which assesses integration of employee and corporate wellness plans with existing operations, e.g. current data systems, or abilities of internal communication departments to support wellness programming. Surveying executives to determine comprehensive strategies in defining and developing or refining wellness programs to have broader influence on sustainable corporate culture. We use a Starter-Benefit/ Wellness Analysis Assessment (TM) that involves interviews, surveys, and review of current data systems. We also provide an on-site visit with your management and wellness teams to assess current resources, evaluate and determine what is needed to develop a comprehensive strategic wellness plan. We provide a comprehensive resource analysis and make recommendations to your management and wellness team. A comprehensive resource Value Based Health Care Management [VBHCM] analysis is available for organizations that desired to include cultural change. The VBHCM analysis also includes assistance with selection of supplier/vendor/partners. This includes development of a wellness management systems plan that provides for post enrollment assistance in understanding and using health coverage plans once purchased. Pre-planning to fully integrating wellness programs into the health benefits plan. Provide a gap analysis: alignment of comprehensive wellness programs with business objectives, health care cost savings objectives and employee rewards. Evaluate existing wellness plans; the pre-planning stages or programming, prior to selecting a vendor. Re-evaluate existing wellness programs and make recommendations to align programs with cost saving strategies. Assist with selection of a wellness program vendor and/or setting up accountability standards for them. Please contact Walter Wright (admin@abbottsolutionsinc.com) with any questions. Consultant time: Includes a Starter-Benefit Wellness Analysis (TM) and an on-site visit and detailed final recommendations for approximately $5000, dependent on quality of data supplied. Travel and Overnight Lodging: Includes one day on-site visit approximately $2500, location dependent. *A more comprehensive resource analysis is required for Value Based Health Care Management that includes cultural change. Cost is dependent upon data available and ease of access. We then assist with selection of supplier/vendor/partners or develop a wellness management systems plan as appropriate and provide post enrollment assistance in understanding and using health coverage plans once purchased. Speaking fee beginning range: $2500/keynote and $4000 for key-note and 1/2 day workshop plus expenses. How Will You Know When We Get There? You can decide if your team is ready to continue on your own, or you can contract with Abbott Solutions, Inc. to obtain additional consulting and training or to provide an on-going evaluation of plan designed to hold all parties accountable for engaging employees and evidenced based wellness programs. Abbott Solutions, Inc., works as an outsource contractor to provide customized research and on-site consultation, evaluation, training and coaching as needed: consulting, new ventures, expertise requests, and business resource. "Abbott Solutions provides extraordinary insight and knowledge in asking all the right questions organizations need to consider when attempting changing their culture. Organizations often recognize a need and feel they need to bring in vendors to help educate them on potential solutions. Often an organization will bring in the vendors prematurely without a real understanding of their own internal culture and a vision of the end product. Abbott Solutions helps to identify an organizational culture and objectives to better facilitate the best outcome. With the extensive wealth of experience and ability to individualize their deliverables, Abbott Solutions prepares an organization to be well educated, informed and mindful when planning for change. Abbott Solutions has expertise in identifying the current organizational culture and helps position them in the development of meeting their new cultural objectives. Abbott Solution dives into asking the right questions, searching for the right answers and always delivering the right outcomes." "Thank you indeed for your excellent presentation at the recent 21st Annual National Health Benefits Conference & Expo (HBCE), in Clearwater Beach, FL. The participants found the Sessions to be extremely informative – yours was noted as one of the best by several attendees standing out in an all-star field. By all accounts and from many sources, it was considered a very successful Conference. We all very much appreciate your fine contributions to that success and it was a pleasure to meet you." -- Gene Eugene S. (Gene) Piatek, PhD, President Health Benefits Conference & Expo (HBCE). "Dr. R.A. Abbott’s extensive knowledge and experience in the health care industry provides outstanding expertise for health care organizations. Be certain to take the opportunity to utilize the insight, vision, and vast resources she will bring to your organization." -- Fred Leafgren, PhD., Co-founder of the National Wellness Institute and Chairman Personality Resources International [ON] L3R5B4 Canada. Duke Center of Living, Duke University (NC). Thomas Jefferson University Hospital (PA). St. Mary’s Hospitals in Troy NY, Duluth MN and CO.
Thoracic and Cardiovascular Institute (MI). American Corporate Health Programs (PA). Vantage (Polar) Monitors, Inc. (WI). St. Vital School Division (Canada). Who is R. Anne Abbott, PhD. R. Anne Abbott is the priniple owner and founder of Abbott Solutions, Inc. Abbott is an accomplished administrator, published author, and seasoned public speaker and facilitator. Abbott works with caring organizations that desire to successfully bridge efforts between multi-disciplined professionals in order to provide exceptional services to clients, consumers, and employees. "I believe my life's work, my practice, has been to act as the bridge between good intentions and measurable outcomes, where people and community can make a difference and enhance health, wellness and the human capacity!" Dr. Abbott is a Professor Emeritus in Health Promotion and Wellness at the University of Wisconsin-Stevens Point, which was the first wellness and health promotion professional degree program in the country. Since 1975, Anne’s life's work has been to successfully bridge efforts between multi-disciplined professionals in order serve students, patients and organizations. She has helped create four professions: Clinical Exercise Physiology, Cardiac Rehabilitation, Health Promotion/Health Protection (Safety). She currently is working to form trans-disciplinary the efforts between Wellness and Health Benefits. She was one of the first Clinical Exercise Physiologists. She was editor of ACSM Guidelines 1975 and helped create the Certifications Process. As Founding Fellow of AACVPR, she helped create cardiac and pulmonary rehabilitation program certifications. In Wellness and Health Promotion, she helped to establish the first competency based 7 dimensions of wellness model. She was the recipient of NWI Leadership Award, and currently serves on the NWI Board of Directors and the Board of Experts for publication of The Exercise Standards and Malpractice Reporter. Ph.D., University of Pittsburgh (1981). Exercise Science and Epidemiology. M.S., Florida State University (1970). Exercise Science. B.S., East Tennessee State University (1969). Physical and Health Education. National Wellness Institute (NWI) Board of Directors (2013-2016). International Foundation Education-Benefits-Compensation. Health Benefit Plan Basics, Choice Based Benefits, Health Care Cost Management - Certificate in Health Care Plans.(2013). NWI Certified Worksite Wellness Program Manager (CWWPM). Identity Mapping and The Four Ways System, Personality Resources International (PRI). NWI National Leadership Award 2009. Liability and Legal. Serves on the Board of Experts for publication of The Exercise Standards and Malpractice Reporter. Gestalt Therapy, New England Institute of Gestalt Therapy, Boston, MA. Founding Fellow American Association of Cardio Pulmonary and Rehabilitation (AACPR). American College of Sports Medicine Program Director® #15, American College of Sports Medicine.